It can happen, in spite of proper spa and hot tub maintenance. Considerations and Solutions for fixing a spa or hot tub leak. Using the right products for leak repairs!!! Pool and Spa leaks can involve cracks, in walls, pipes, skimmer, fittings and equipment. 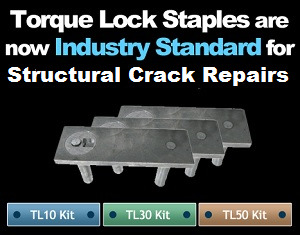 The Torque-Lock system uses staples, to stabilize a structural, concrete crack, making a permanent, rock-solid repair. Fix A Leak is the easiest way to seal many common pool and spa leaks. Fix A Leak has been sealing leaks, of all types, for over 35 years. 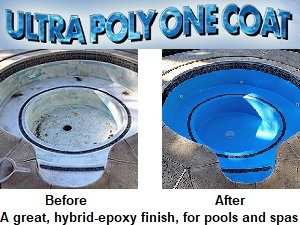 Ultra Poly One Coat is a hybrid epoxy coating, that can be used to refinish masonry or fiberglass spas and swim-spas, after the repair work has been completed. 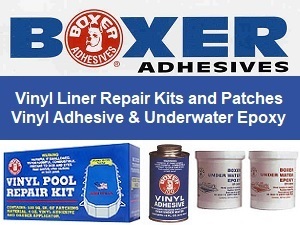 Boxer Adhesives offers vinyl liner, underwater repair patches and an underwater epoxy, for sealing leaks in a variety of material and places. The addition of an in-line anode can reduce metal corrosion, which could cause leaks. A ColorQ all-digital Pool and Spa Tester can help you maintain optimum chemistry and avoid corrosive conditions, which can cause leaks and damage equipment. How to treat and repair spa, swim spa or hot tub leaks? Spas and hot tubs can develop leaks as the result of routine wear and tear, carelessness, accidents or the effects of wintertime damage. Not all loss of water can be attributed to a leaky spa or hot tub. Losses, due to evaporation, splash out or prolonged uncovered periods are normal and are expected. Excessive water loss, more than approximately 1/4" daily, should be investigated, unless the unit is covered for long periods of time. Products are available to help determine if there is a spa or hot tub leak, where the leak is located and to help seal the leak. There are companies that specialize in spa or hot tub leak detection and repair. If problems arise, refer to the Spa Problems Page, as a source of problem-solving information, broken down into various categories. Scroll down the page and click on the linked keywords, catch phrases or images, in the archived answers below, to access additional information, on that topic or product. Some Fix A Leak users have sent us some comments. We would love to add some more, so feel free to send them in. I have a 375 gallon spa and it has a small leak. Locating the leak is a problem, because of the insulation and I don't have access to all sides of the spa. Would Fix A Leak work? Thank you. You might start by removing any wet insulation, that coats the shell. Water travels, go the leak might not even be where the insulation is wet. Fix A Leak forms a crust, as it leaks out. This needs to dry out and cure to make a long lasting seal. Having limited access, to the surround, does not help. When not running the pump, open the cabinet and use a fan to help dry the underside. If you ever need a new spa, think Arctic Spas. Instead of insulating the shell, they chose to insulate the entire cabinet and specially designed floor. In addition, you can access all four sides, as the insulated panels are removable. With a Arctic Spa, if there is ever a problem, access and serving is much easier. Fix A Leak is certainly worth a try and can be very successful, as the fan mail will attest to that. The truth is many spas might have been designed better, but the bells and whistles come first. I hope that this will be helpful and, perhaps, informative. ► How Much FIX A LEAK To Use? I have a 400 gallon spa that leaks around a couple jets. Is 2 to 3 oz. of Fix A Leak all I need to use? It is suggested that you use about 8 ounces of FIX A LEAK product. The use of more product might require that you empty and clean the spa. Being that the spa leak is around the return jets, if your spa has a sprayed on type of inner insulation, you might want to drain the spa and leave it empty for 3-4 days before beginning. This will allow the insulation to dry out. Otherwise, the damp insulation could interfere with the curing process. Use this link, to browse through more complete and supplemental directions. I hope that the information proves to be helpful. Hi Alan - Greetings from Prescott, AZ. We had water oozing from underneath the spa and Fix A Leak did exactly that! Fixed the leak. Great news, considering the alternatives. The question is: Can I safely drain the spa onto the ground without endangering the trees that are downhill from the spa site? Any other environmental problems with siphoning onto forested areas? Again, thanks for recommending such a great product. Once you adjust the pH of the spa, the Fix A Leak, present in any discharged water, will be harmless. The only common chemicals to be concerned about are chlorine or bromine and these should not cause a problem, so long as the level is not overly high. Glad to hear that the Fix A Leak product succeeded in solving the problem. ► Drip, Drip and Dripping? My Spa is 12 years old and has a leak in the pump housing. Will the Fix a leak be able to fix that? It drips a drop every second or so that the pump is running, doesn't leak with the pump not running. Thanks. It is probably a pinhole. that leaks when the water is under pressure: the pump is on. This type of spa leak does respond to Fix A Leak. It is certainly worth trying. Remove the filter cartridge and slowly pour into the skimmer, with the filter running. Keep it running until the spa leak stops. while stirring the bottom occasionally. After the spa leak stops. shut off the spa, for 2-3 days. LEAVE THE CABINET DOOR OPEN AND VENTILATE WITH A FAN, IF POSSIBLE. After adding the product, operate the pump for an few hours at a time, spaced throughout the day. Use a brush to help stir the bottom, as the product is heavy and will sink. When possible open the cabinet doors, to help dry out the product, as it leaks out, which helps make a long lasting seal. Wait a few days before restoring the system, in order to give the product a chance to cure. Inasmuch as spas should be drained periodically, this would be a good time to drain and clean and allow a few days for the underside to dry out. I hope that this solves the problem. Alan, I just wanted to let you know Fix a leak and your suggestion worked great! It's been two weeks, with nary a refill needed in my spa. I have a large Spa, 640 gallons, and have used Fix A leak. It stopped the leak and I let the spa sit for 3 days then drain and refilled the spa ,after that I still had a leak, so I have just done the process again. I used 12-14 oz of Fix a Leak and the spa has not lost any water in 48 hours. Should I wait a couple more days before draining and refilling? Do you see anything I could have done better? Thanks. It is a good sign the spa leaking has stopped. Now you need to get the product to cure and for that it needs to dry out completely around the site of the leak. Open the cabinet and allow air to circulate freely. If possible remove insulation around the leak. Use a fan to blow air in, if these are dead zones. Give it 2-3 days for the Fix A Leak to cure and then empty and clean the spa. I hope that it all turns out well. 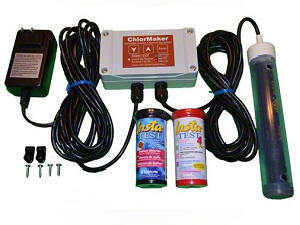 ► Using Fix A Leak, With A Salt Chlorine Generator? I have a leak in my spa, which has a salt chlorine generator. Do I have to do anything different, other than what is spelled out in your expanded supplemental instructions? Thank you. The presence of a salt chlorine generator makes no difference in how Fix A Leak is used. Just follow, the expanded, supplemental instructions. This is important, because only a limited amount of information is printed on the bottle. I hope that this is helpful. ► Will Fix A Leak Work? I have a 5-6 person hot tub outside in North Dakota. Our temperature is dropping and my hot tub is leaking. I have had so many problems with it this past year. Put in a new circuit board and new pump, 2 new sensors and a flow switch. It was finally up and running and has now started to leak, approximately ½ - 1 inch per day. There is no water in the equipment compartment. I removed one side panel and could not see any plumbing - it has that sprayed in insulation. It sits on my deck and I can see water dripping underneath. Is this something that the fix-a-leak stuff would fix? Thanks much. The letter below was received immediately prior to yours. Yes, it can work, in a great many cases, and this letter says it all. For ordering information go to The Fix A Leak Store. Alan, I purchased a bottle of Fix-A-Leak last month hoping to repair a leak in my 8-year old spa. The spa developed a leak 2 years ago around several fittings and had to be shipped back to the factory for repairs. And because of the foam insulation, there is no way I could have located or repaired the leak myself. It cost me $900.00 to have the unit craned out and back into to my backyard the first time, but fortunately, it was still under warranty so the repair was free. With the warranty now over who knows what this repair would have cost. I applied the FIX A LEAK product, per the instructions and no more leak. The supplemental instructions, you supplied, were very helpful. It saved me the cost of factory repair. Thanks. Good day, I live in Wichita, Kansas and I have an inground spa which is leaking. I have been told that the product Fix A Leak from Marlig Industries will remedy this situation. The leak rate seems to be the same with pump on or off or on high or low. Do you think this may solve my problem? Do you have any other suggestions other than removing the shell from the hole to try to find the leak and repair it? Thank you for your time and assistance. Best regards. It is probably not a major spa leak: just the type that could be sealed by the FIX A LEAK product. It can make a long-lasting seal, in a small spa leak, possibly as big as 1/8". It is certainly worth trying, given the modest cost and the alternatives. Pool-spa leak detection services can help locate the problem and minimize the repair efforts, should other efforts prove unsuccessful. I don't know of any other options. Good luck. This afternoon, I purchased a 8 oz bottle of Fix A Leak. When using this product, does the water in the hot tub have to be hot or cold? At this time the water in the tub is clean cold tap water. approx temp 52° F. The tub capacity is 250 gallons, so I understand that I would only need to add 4 ozs., initially. I would appreciate your reply. Thank you. This is a really good question and I was surprised that it was not asked sooner. I checked with the manufacturer and was informed that FIX A LEAK can be used at typical spa temperatures, It is recommended that the water temperature be in the 70° F or above range. In your case, the water temperature should be raised. Good luck and thanks for writing. ► Where To Purchase Fix A Leak? Could you give me the name of location where I could buy Fix A Leak. My spa has a leak, in a area that is hard to reach and I thought that I would give it a try. My zip code is 11746, if that helps. For local dealer availability, call 905 374-2560. They might be able to provide you with the necessary information. Because they sell through distribution, they don't always know the names of local dealers. Otherwise, you can order Fix A Leak from this website. It will ship the same or next business day. I hope the information helps solve the problem. I have a slow leak in my hot tub. I have found the leak, it is where a hose connects to a jet. My question is, will the leak stop stuff fix something like that or any idea how to get the hose out and reseal it? I don't want to seal it from the outside of the tube. Thanks. Fix A Leak can seal hot tub leaks as big as 1/8" in diameter. It seals, as it leaks out of the spa and forms a permanent seal from the inside out. After the product is added, bypass the filter, keep the water turning over every now and then, in order to keep the product suspended. Once the hot tub leak stops, open up the cabinet and allow the product 24-48 hours to cure and make a very long-lasting seal. If this fails, you might have to do more extensive searching or consider calling in a professional pool-spa leak detection service. Good luck and I hope that this information will prove helpful. Price includes shipping to US. Every order includes expanded, supplemental usage directions. Full cases shipped outside of the US (lower 48) may require additional shipping charges, based on destination. A PayPal Invoice will be sent, to cover the difference. You do have the option of requesting cancellation and a full refund. * Extra Savings on U.S. Orders Only: Ship multiple bottles, up to $74.99, for only $9.99. Free U.S. Shipping, on orders over $75.00. * A $9.99 handling charge will apply to Continental U.S. Orders, under $74.99. U.S. Orders outside of the Continental U.S. may require some additional charge, based on quantity and destination. I have noticed approx. 3 inches of water loss per week in my 400 gallon hot tub. It is outdoors and it has been cold. I have a good cover. Is this normal water loss or could it be a leak? Thanks. I don't recall ever seeing figures for water loss for a spa that remains properly covered, except for periods of actual usage. From my own experience, it seems to be well beyond what should result from evaporation. Depending upon the size and shape of the spa, an inch of water loss could amount to 10-20 gallons. I suggest that you double check that the cover is sealing reasonably well and then start looking for evidence of a spa leak. In the final analysis, if you conclude that there is a probability of a spa leak, it may be possible to seal the spa leak, but you have to locate it. You might consider calling in a pool-spa leak detection specialist. First, you might consider using Fix A Leak, which just might solve the problem, at a fraction of the cost. Good luck. 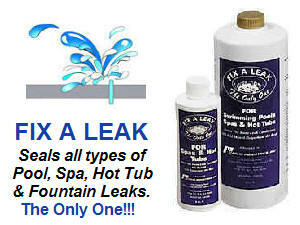 There is a product called FIX A LEAK that can be used to help seal the spa leak. The product directions will explain how it should be added to seal leaks that might be in the plumbing, shell or installed fittings. It has been sealing spa leaks since 1980. Hopefully, your problem will be solved. I hope that I have been helpful. ► Reversing Flow Stopped Leak? Hi Alan, Greg B. here. We talked before. I ran my hot tub for about four hours. The water level stayed where it was. After letting it sit for a couple of hours, I noticed the water level had dropped. So from our previous talks, I assume I have a suction leak. I reversed the lines on my pump, took out the filter. I put in 12oz. of Fix-A-Leak. Turned the pump on for around 3 hours then shut it off. I check the water level and was still the same. I checked back in 3 hours and it was still the same. Checked the next day in the morning and after I got home from work, still at the same level. It looks like the leak has stopped, but not really sure what the next step is. I don't understand how the Fix-A-Leak can set-up and get hard, if it is still submerged in water. Can you let me know what to do now? Thanks. It is simpler than you think. As the water leaked out, the Fix A Leak formed a crust, which sealed up the hot tub leak. This crust is outside of the hot tub and is not in contact with the water. Now you have to give it a few days to thoroughly cure. Remove any wet insulation and ventilate the cabinet, with a fan, so that things can completely dry out. Occasionally, stir the hot tub. In a few days, drain and clean the hot tub. Rinse the filter, as well. Lets hope that, after refilling things, stay dry. Good luck. ► Is There A Spa Leak? I have a fiberglass "jogging tank" in my basement, a 34 inch diameter, 6 foot cylinder with spa heater, pump etc. I calculate this tank holds 255 gallons using 5.5 feet of water. Surface area is 6.21 square feet. It heats rapidly to 93 degrees from the low 80s. Ambient inside temperate is around 70 degrees. It loses 1/16 inch each hour without the pump (covered with a 3/4 inch diameter plastic bubble sheet) and 1/4 inch per hour while pumping and heating. The contractor who just installed the system believes the problem is all evaporation. I believe a leak is present. I am reluctant to use "Fix a Leak" without knowing exactly the problem, IE what if it works for only a short period and also I am not certain that this much water under my house is a good thing. Your opinion and advice will be greatly appreciated since the contractor is reluctant to really search and repair a leak. Your site is a great source and I appreciate your efforts. Thank you. I can't definitively state that you have a spa leak. Evaporation just cannot be excluded. I suggest that you do the following and let the facts speak for themselves. Mark the water level with a line on a piece of tape. Cover the unit with a solid plastic sheet and seal off with duct tape, making is as airtight as possible. Give it a day and see the results. If there is a loss, you have the answer: a spa leak! If there is no loss, repeat the procedure, with the pump running for a few hours. This time, if there is a loss, the problem is in the plumbing system and FIX A LEAK might be worth a try. I understand that you are, rightfully, concerned about water under the basement, but you are neglecting water vapor in the basement. I suggest that you use a cover a bit more effective than some bubble film. Good luck and I hope that I have been helpful. ► Spider Cracks And Leaks? I own a 500 gallon above ground hot tub. This spa is famous for spider cracks in the front wall where the step and light are located. Spider cracks form because of the bad design, no insulating foam or support in the pump compartment and a large jet shakes the wall. Has been repaired, but continues to form new cracks. I was considering dumping it in a landfill, but heard of the Fix A Leak product. In this case, would Fix A Leak be effective? Great endorsement for the spa company! It sounds like you have been down the road. Who is the manufacturer? Fix A Leak could very well make a very long-lasting seal. I can't guarantee a new crack won't form, but it is worth trying. Have you ever considered painting the spa? Ultra Poly One Coat is a high tech, hybrid epoxy coating that might seal the surface on a more permanent basis. Sealing first and then applying the coating could be the way to go. Good luck. Hope you can answer this one. We are in the process of having an inground pool and spa installed. They have done the dig, the gunite, the tile and the plumbing so far. My question to you is twofold: First of all, we live in Florida and since there is not much space between the houses, we paid extra for a "small dig" machine to do the dig. They started with the "small machine" dig and found that it was taking too long, so, they stopped with the small machine, after two hours, and brought in a big machine to do the dig. They advised us that they do not owe us any money back for bringing the big machine in instead of the small machine. My second question is: We have a pool and a spa. The spa is level with the pool. My husband decided to put some water in the spa. It has been five weeks since the gunite was done and there is a leak from the spa wall into the pool. In approximately a 5 hour period the spa leaked about 10 inches of water into the pool area. Again, the pool and spa have not had the exposed aggregate finish applied yet, but I was wondering if I should advise the pool company of the leak. They really are not very cooperative, so I didn't call them about this. If you think that it is something that will be "fixed" once they apply the finish. Any assistance would be appreciated. Thank you. Based on the first question, their actions border on questionable. You're paying for their mistake or to speed up their work. Of course, you will recommend them to all of your friends? They evidently don't realize that today's recommendations are the sales of tomorrow. There may not be anything wrong with the spa. It is the pool and spa finish that makes the concrete shell watertight. Inasmuch as the pool and spa remain unfinished, the leak might be normal and not unexpected. There's no way to be sure at this time. After the pool and spa are plastered, all leaking should stop. If not, there is a problem. Good luck and I hope that I have been of some assistance. ► Leak Has Stopped - Do I Drain? Hi, I just used FIX A LEAK in my hot tub. Amazing! The dripping is gone, thank you. Now do I need to drain my tub? That's great news. As far as I am concerned, a spa should be drained and cleaned every few months and this is a good time to do it. I would give it 48 hours and then drain and clean. Thanks for the feedback and I'm glad to have been of assistance.